You are using Facebook since a long time and share good amount of information on daily basis with your friends and followers. Now its time to find out the most active and biggest fan on yours on Facebook. Who commented most on your status and even liked most? Who is the true follower of your Facebook account? Let’s find it thru a simple app. 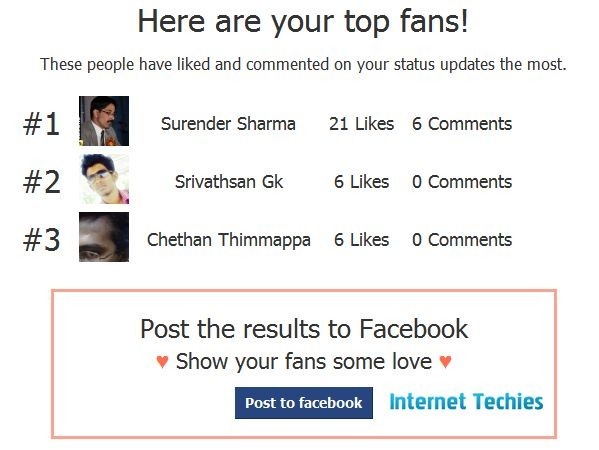 Biggestfan Facebook App will tell you that who is your biggest fan who has commented and liked your status updates most. Go to this page and click on “Start” button to allow access for your facebook account (this is normal for any app installation). 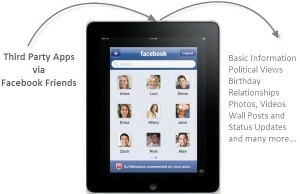 It will take some time around 15 seconds to find out your biggest fan and true friend on Facebook account. I scanned my account with this app and here is the result. You can share the result with your friends and followers as well. If you don’t want to keep this app in your Facebook account after getting the results, you can delete or remove this app from Facebook Application Settings under “Account” dropdown on top-right corner. Thanks Sudharshan for finding this app. So did you find your biggest fan or true friend on facebook? Share your experience.